The Hospitality industry has a reputation because of its subtle behaviour with the audience at large. The services rendered under the hospitality industry are all about keeping the customers happy and meeting their expected standards. The places like restaurants, hotels, tours and travel agency, etc are all about how you present yourself before the customers. When we talk about being presentable, the whole focus is on the way you dress and communicate with the clients. One of the key players in appearing presentable are the hospitality uniforms. Every service organisation has a uniform which represents them in a unique fashion. 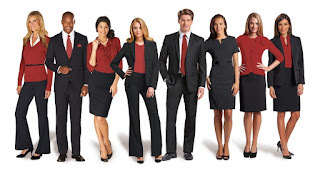 Your customers are one of the major reasons why you need to dress in a presentable manner. Do you think the advantages way beyond than entertaining the customers? Let’s read further to find out. Did you know having a uniform policy for the entire staff in your sector can increase the footfall? Yes, it is one of the surprising benefits of designing hospitality uniforms for your business. Every business unit has a unique service to deliberate. This uniqueness can be visualised with the help of uniforms. Baffled over the fact? Let’s prove the point with an example. Air Hostess serving on airports and flights are usually observed wearing blouse accompanied by a skirt and scarf around the neck. This implies that even in the crowd of thousands, one would be able to identify the Airhostess. In more simple words, the uniforms are doing the job of marketing the business on your behalf. Sharing a common uniform among your entire staff is the key to build team spirit. Uniforms, especially the ones in the hospital industry are designed to be more elegant and fancy than the corporate uniforms. The fancy uniforms are designed not only to uplift the environment but also enhance the appearance of the employees. To look good is to feel good and so when the employees get their enhanced look the direct impact is witnessed on their work proficiency. In simple terms, the uniforms are one way to boost the sense of work environment within the staff. According to the study, employees working in uniforms have proved to be more responsible than those working in casuals. Restaurants, flights, and hotels, these are the few places that are more likely to be affected by stains and dirt. For example, while the chefs working in the kitchen, the food stains are a threat to the clothes of the person. On top of that, Chef’s Hat is part of the uniform that prevents unhygienic elements to fall into the customer’s meal. The uniforms are also held as a part of employees safety where they are protected from fire and any other harmful elements. As a customer have you ever compared a staff that follows the decorum of uniform compared the staff which does not? The impression should be pretty clear, the staff with uniform seems more presentable and responsible. By wearing those uniforms they entail a sense of security in their customer’s mind. What’s more? The uniforms act as the cover page of your book. Similar as well as other industries in the market shall recognise you as strong competition. The perception is quite natural as in this modern age every sector is expected to deliver a sophisticated appeal. Last but the most obvious benefit of uniforms would be pleasing the clients. The hospitality industry deliberates services dedicated entirely for the benefit of the customers. Uniforms play a vital role in creating the first impression on your prospective clients. Adding more to the advantage, uniforms allow your staff to be identified easily. Following to which customers know whom to call for assistance when wandering on an Airport or hotel. The end result? There is hardly any space for confusion when it comes to identifying the staff. Without a second thought, the hospitality industry has a life long prosperous future. This clearly indicates that the number of businesses entering this sector are increasing to establish a fierce competition. The pace at which uniforms are becoming the identity of hospitality sector all the business units are engaging themselves in creating a uniform policy. To begin with, even the small cafes, bars and restaurants in the town are taking a step towards dressing their staff in fashion-forward uniforms. The multinational business units in this sector are partnering with big Fashion brands to create impressive uniforms for the staff. Such a partnership is fruitful when the hotel management or restaurants turn to a global platform. The people from across the globe are going witness your style of presentation both in terms of services and uniforms. So associating your business with fashion brands is likely a sound decision made.